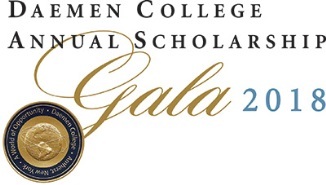 AMHERST, N.Y. – Daemen College will hold its annual Scholarship Gala, one of the college’s premier events to raise scholarship support for students, on Sept. 7 at The Buffalo Club. The evening, which is being held as part of Daemen’s Founder Celebration, is scheduled from 6 to 10 p.m. and will feature a cocktail reception, dinner, and live music. This year’s gala will include the presentation of the 2018 Community Excellence Award to Joan “Joni” Cooper Stovroff, president of Stovroff and Taylor Realtors. Stovroff, a long-time entrepreneur, leader, and philanthropist in the Buffalo Niagara region, has been active in the community throughout her career and has served on several boards. A strong supporter of Daemen, Stovroff is a member of the college’s Community Advisory Board. Her family established at Daemen the Joan Cooper Stovroff Endowed Scholarship for Women in recognition of her exemplary career as a business leader. Proceeds from the Scholarship Gala will contribute to the $22 million goal for Daemen’s “Drive to 75” campaign, the college’s first-ever comprehensive campaign that was publicly launched last fall.